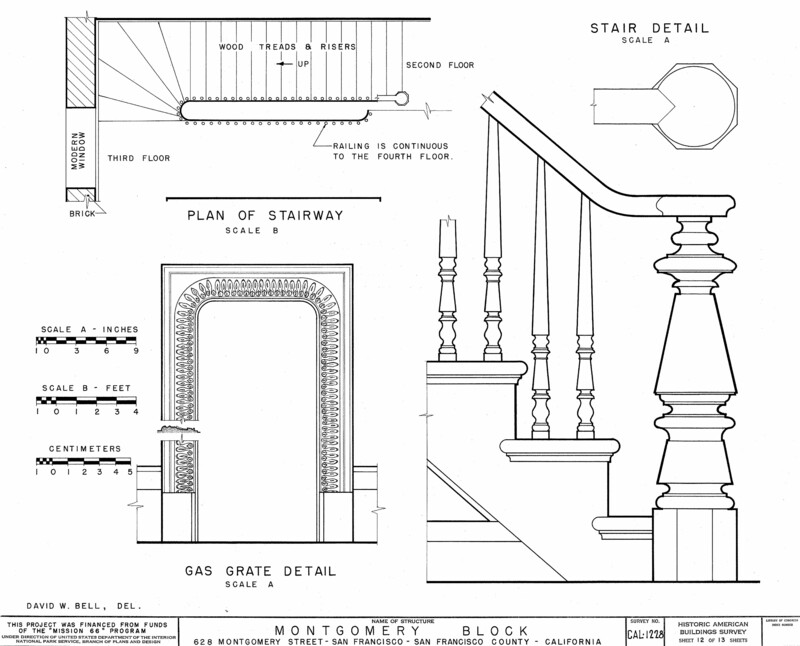 In my search to understand what it felt like to walk the halls and offices of the Montgomery Block, just having architectural drawings — even very detailed ones — wouldn’t be sufficient. 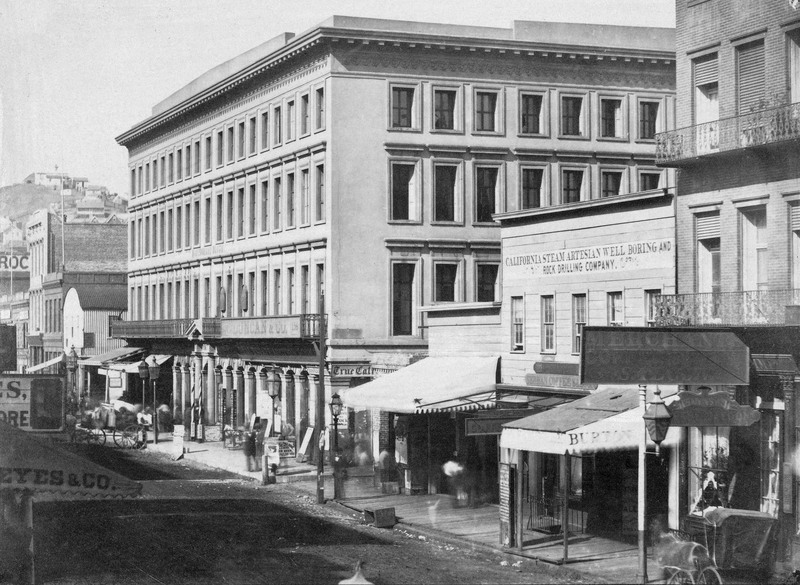 Luckily, the Historic American Buildings Survey of the Montgomery Block contains a handful of black-and-white reference photographs of both interior and exterior views. The photograph above was a crucial document for confirming wall thicknesses, general construction quality, and condition of the building. It was also a perfect test subject for my 3D model of the building. If everything shown in the photograph aligned with the corresponding feature in my model, then I would know for sure that my model was right. The first step in building my own Montgomery Block was to follow the instructions for building the subcomponents. Doors, chair rails, stairs, and windows all had been meticulously measured and recorded, and all I needed to do was to transfer those measurements into the digital world, then copy and paste them throughout, according to the floor plan, until I had a completed model. In theory, it would be a simple process. One of 13 schematic diagrams in the HAB survey. 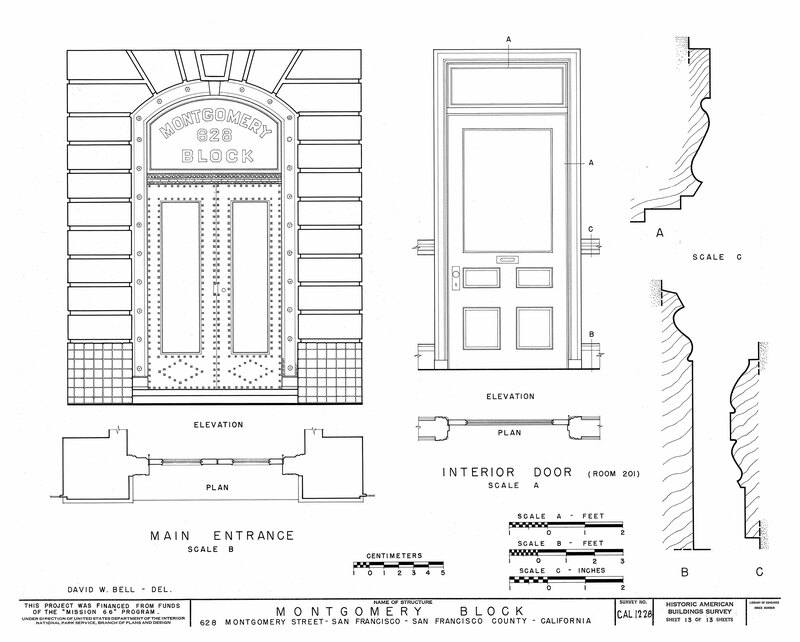 This one addresses details of doors and mouldings. Building the first door — just one door — took several days of trial and error. 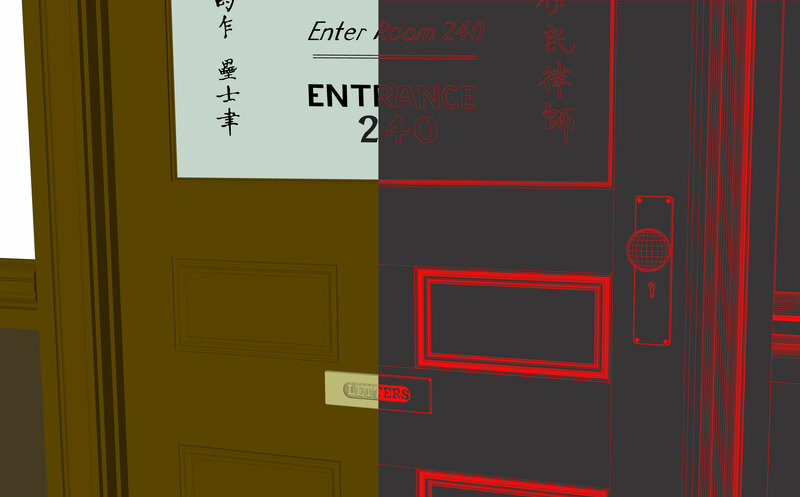 Then, upon further inspection of photographs, I soon learned that between offices, there were variations in doorknob height and hinge placement, letter slot placement, and door frame depth that equated to 256 possible variations of my door subassembly throughout this one building. My workload soon ballooned. I rolled up my sleeves and got to work. Every detail that could possibly be captured in the 3D model was faithfully recorded, including ridged brass letterplates and hand-painted window lettering. But eventually, I finished, and captured in 3D every detail I could verify. 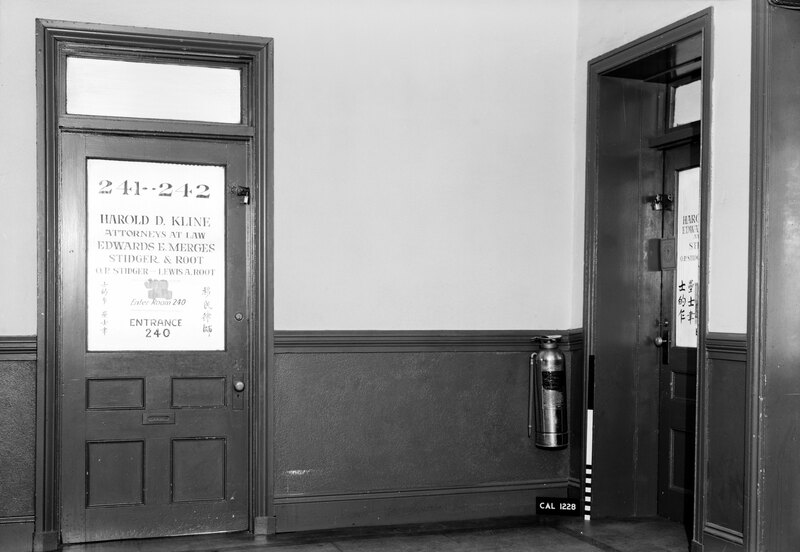 From the ridges cast into the brass plates on the letter slots, the corners of hallways lined with intricately curved mouldings, to every sweeping curve of hand-painted lettering on the office windows – everything had now been dutifully and digitally recorded. The time to test the model had come. To my great relief, everything snapped into place perfectly. 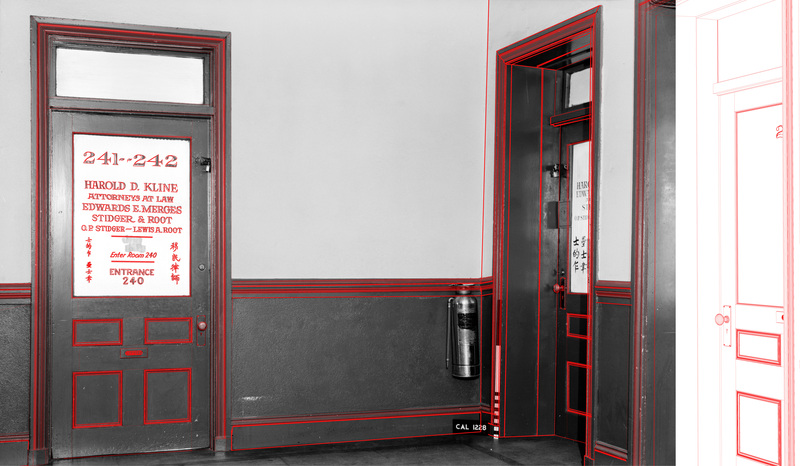 Miraculously, the lines in the 3D model aligned perfectly with the historical photographs. Seeing the lines click into place on the old photograph, I felt a connection to the surveyors who had measured, scribbled figures, and drawn the details of the Montgomery Block. In the summer of 1958, in the same well-worn corridors where General Henry Halleck, Ambrose Bierce, and Adolph Sutro had trodden, these surveyors measured and recorded the historic structure for posterity. Just 13 months later, as the grand structure was being blasted and shoveled away to make room for a parking lot, the surveyors’ documents would be filed on shelves at the Library of Congress in Washington, D.C.
What would be the point of all of that surveying if the work stayed hidden? Surely the conservationists hoped that their work would be appreciated in the future, and that someone, someday, would pore over the details of their work. My digital reconstruction of the building was an effort to decode this message from the past, and the first letters of that message were now spelled out clearly on my screen. 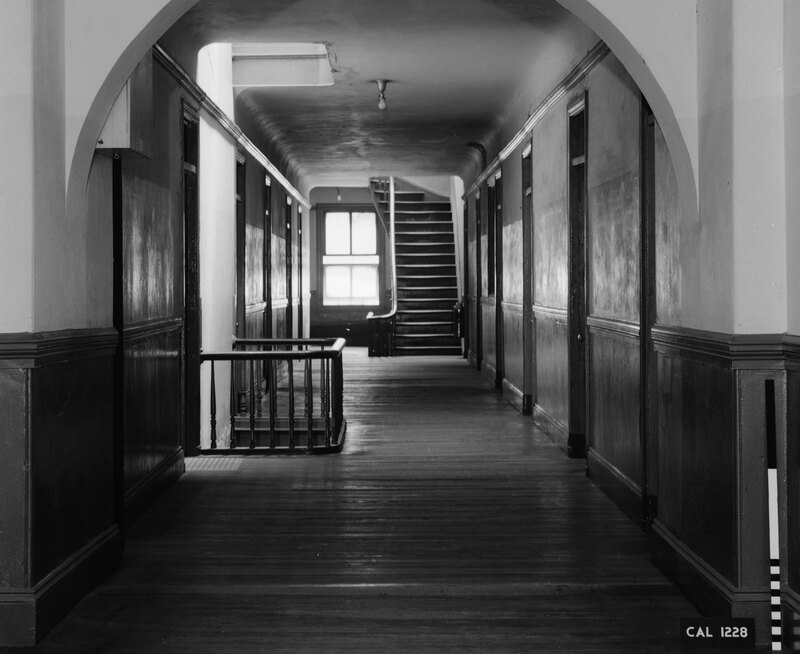 This photo of the third-floor southern hallway, from the HABS, is the only known photo of either of the office wing staircases. 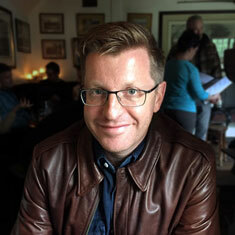 With all details shown far in the background, the photograph reveals very little detail. Despite limited photographic evidence, the staircases had been meticulously measured down to the last detail in one of the HABS diagrams. 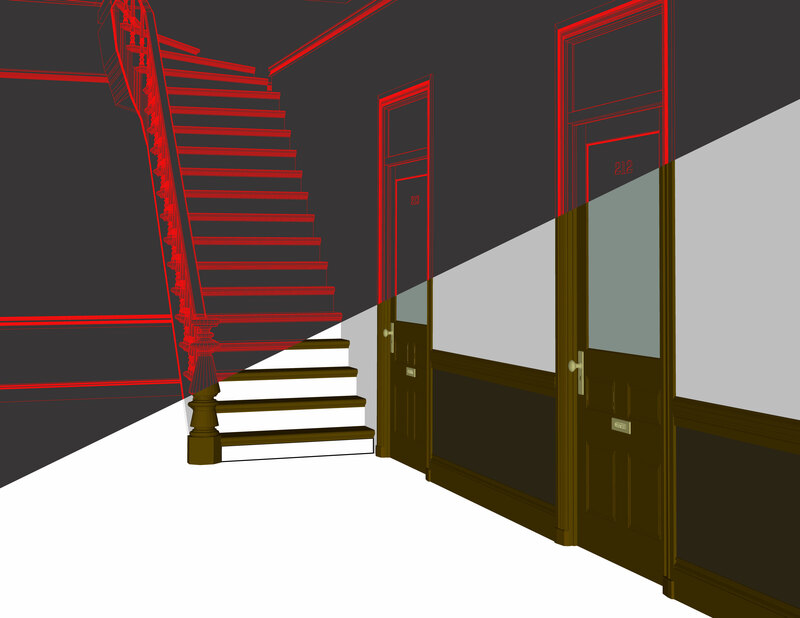 Thanks to the HABS diagram’s faithful record of the staircases’ details, both the southern and northern staircases could be accurately modeled in 3D. This image shows the initial landing of the southern staircase on the second floor, one level below the view shown in the HABS photograph. On the second floor was an expansive fern-lined lobby, with flocked wallpaper, polished brass hardware. Low-hanging clouds of cigar smoke were puffed by the influential merchants, lawyers, and gamblers who plied their enterprises in San Francisco. Among them was a 28-year-old newspaperman from Missouri named Samuel Clemens. He became a regular fixture in the lobby, where he absorbed sensational fodder for articles about the flamboyant and raucous new city. Downstairs on the northwest corner of the building would be The Bank Exchange, the bar made world-famous for Duncan Nicol’s invention of the Pisco Punch. Later still, on the southwest corner, Bohemian artists would paint murals in exchange for wine and a warm meal at Coppa’s Restaurant, dining together in candlelight on the evening after the 1906 earthquake. Over the years, Robert Louis Stevenson, Ambrose Bierce, Bret Harte, and dozens of painters, sculptors, poets, and playwrights would make their studios and homes within the warren of tiny rooms scattered throughout its four stories. Two newspapers, a gold foundry, a bathhouse, and a library would occupy its retail spaces. I have spent several months visiting libraries and private photo archives, poring over old books and drawings, and transcribing diagrams into a detailed 3D architectural model of the Montgomery Block. In a series of essays here, I will tell some of the stories of the famous Block, and along the way, I will unveil digital reconstructions, long-forgotten stories, and newly-discovered photographs, all in the hope of breathing life back into a structure imbued with great symbolic and physical significance to the city and people of San Francisco. 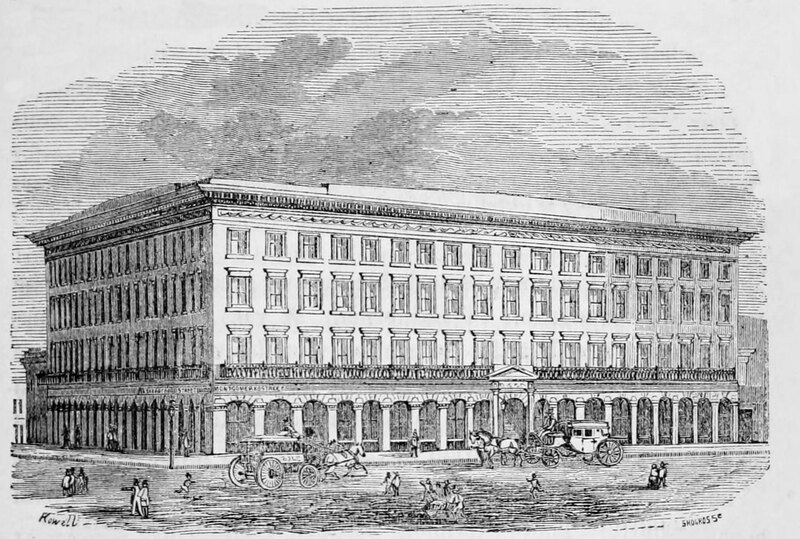 Originally christened the Washington Block when it opened on December 23, 1853, the stucco-clad Georgian building that emerged at the corner of Montgomery and Washington Streets claimed title as the tallest structure in the West. 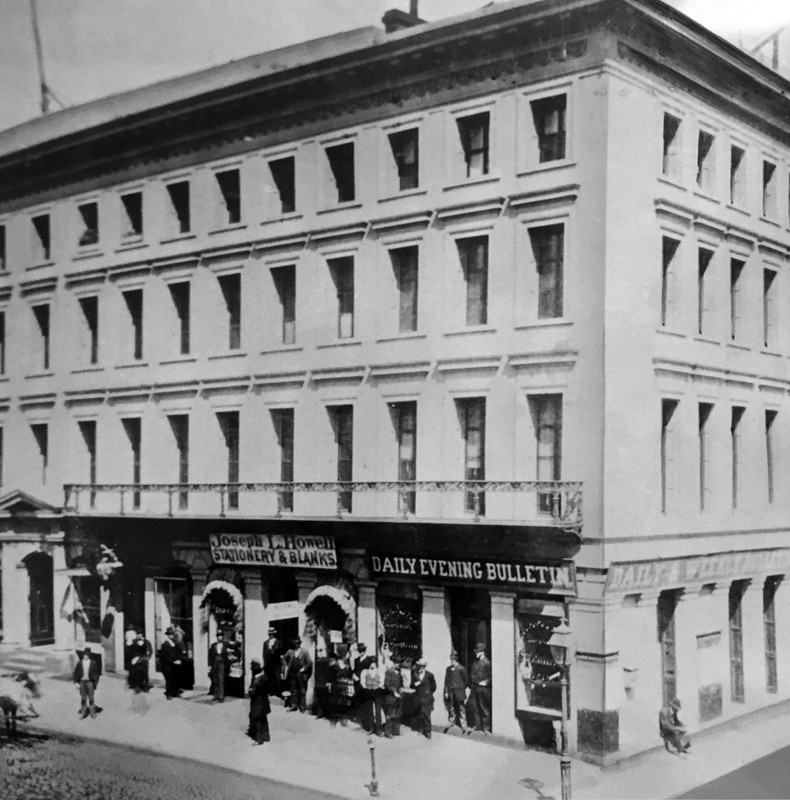 Those early days were a turbulent era in San Francisco’s history. From the earliest days of the Gold Rush, the city had been defined by an irresistibly profitable real estate development market and by notoriously destructive fires that regularly leveled the matchstick-frame settlement. The resulting built environment was in a continual state of renewal, each time defiantly built to be more opulent than before. The Block would never have been constructed except for a gamble by a young Captain Henry Wager Halleck, who convinced financiers to fund a fireproof office building to provide stability amidst the chaos in America’s new western outpost. 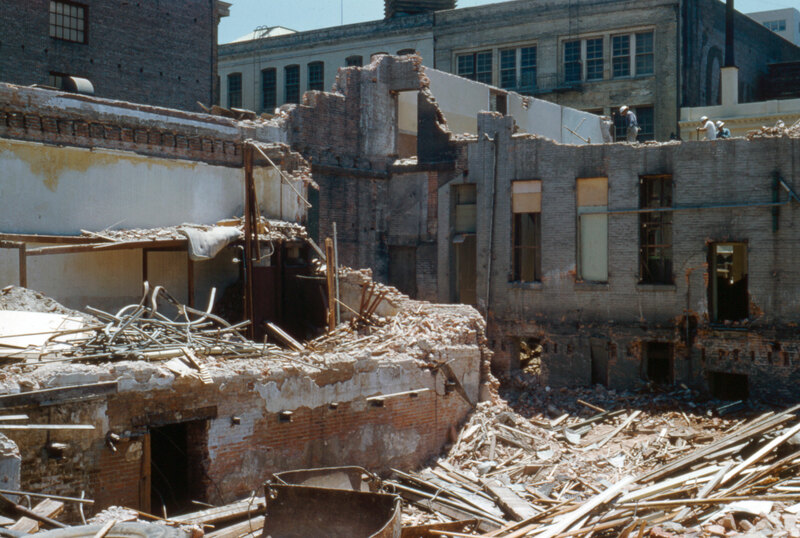 The cycle of destruction and construction continued around the Montgomery Block, ravaging lesser buildings with each new conflagration, until the biggest fire of all in 1906 nearly leveled the city completely. After the Big One, municipal fire protection was given the infrastructure it deserved, and the city’s physical form was allowed to mature in relative peace. But in the decades before 1906, there existed countless versions of San Francisco, each a short-lived attempt at permanence, made ultimately in vain. 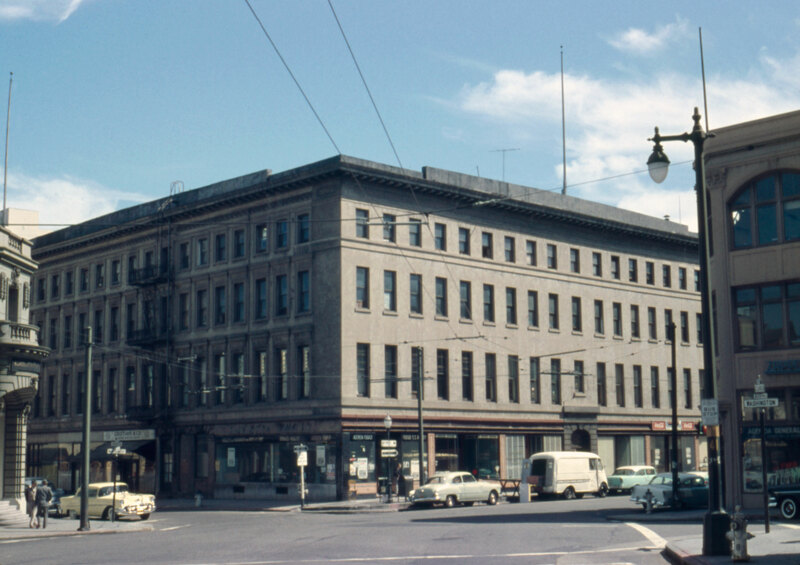 The ghost buildings from those earlier iterations of San Francisco have been largely forgotten, but we have a few precious images to preserve the Occidental Hotel, The Jenny Lind Theatre, The Cliff House (both v1 and v2), and the original Phelan Building, among other structures that didn’t survive long enough to get a second coat of paint. Weathering each of these waves of destruction, one building remained ever standing – the Montgomery Block. More than its physical strength made the Block notable; it occupied a unique place in the minds of San Franciscans from those earliest mud-street days. Chroniclers of early San Francisco and newspaper articles written well into the middle of the 20th century wrote of the grand edifice with a reverence that hinted at its unquestioned status as an architectural and cultural icon of the city. Here was physical proof that civilization could be established in what had been a quiet backwater on the western edge of the American frontier. In his authoritative book Ark of Empire, Idwal Jones called the building a “manifestation of faith”. The Montgomery Block’s fate was sealed by the time its 100th birthday had passed, and no petition or letter-writing campaign would save it. There were years of efforts by conservationists, but 1959 saw it reduced to rubble. For a decade, until construction began on the Transamerica Pyramid in 1969, the plot of land at the southeast corner of Montgomery and Washington Streets was paved with asphalt and used as a parking lot. More than any other, the Montgomery Block is most conspicuous today by its absence. How did we forsake something so important to San Francisco? The project here is a catalogue of my work to use technology to bring the Montgomery Block back to life. Today’s 3D modeling and VR technology allows us to simulate time travel and create the experience of visiting this lost landscape, and many others, in person. Digital technology applied to historical simulation represents an opportunity to revolutionize the teaching of history by making it more accessible – more real – than ever before. San Francisco-based collaborator, product manager, writer, and strategist. Perpetual student and builder of things. Read more.